The so-called ‘practical people’ who dismiss theory as being ‘academic’ (by which they mean unimportant) have missed this critical distinction. We are in trouble now precisely because such ‘practical people’ run the world today. As a result, we are literally flying blind. And the consequential turbulence—the complex and interconnected political, social, economic, financial, and ecological crises swirling around us—is accelerating. My obsession with these incongruities led to the creation of Capital Institute. Since our founding in 2010, we have been collaborating on this journey with a determined and growing network of fellow explorers, including the courageous pioneers who have been on the case for decades. 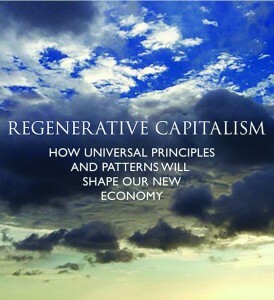 Our work has culminated in the theory that informs Regenerative Capitalism: How Universal Principles and Patterns Will Shape Our New Economy2 and our forthcoming Regenerative Finance white paper due out later this year. This theory is more rediscovery, synthesis, and extension than it is genuinely original insight. But rest assured, this theory has also been experienced firsthand in working models on the ground, both through my own direct investment practice and then via our story telling initiative, The Field Guide to Investing in a Regenerative Economy.3 This is theory informing practice and practice informing theory. My premise is that the history of economic thought did not end with Keynes and Hayek or Minsky and Friedman, leaving us nothing to do but shout our ideological beliefs across the public square. I believe this early stage of understanding regenerative economies is the natural next step in the evolution of economic thinking, bringing economics into alignment with our latest scientific understanding of how the universe actually works, building upon the profound advances of ecological economics as developed by Herman Daly and colleagues. 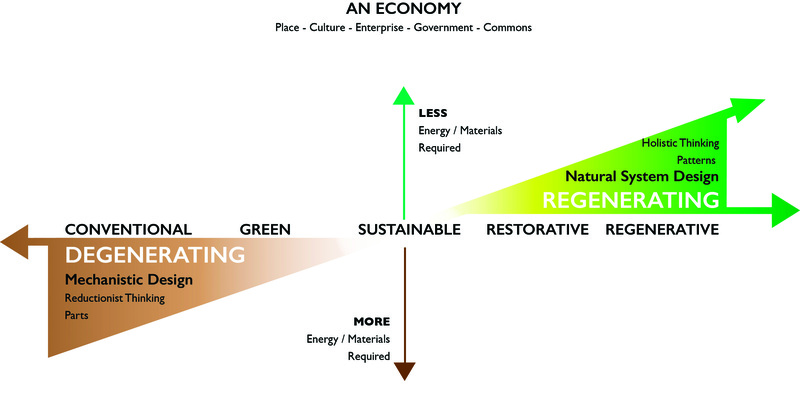 The potential and structure of regenerative systems applies to both ecological and humanistic values; it is not simply a ‘green’ idea. We already see expressions of regenerative efforts emerging all around us, although they are often invisible to those observers still trapped in the outdated reductionist paradigm. Until now, this transition has been hampered by the lack of an effective story. We believe Regenerative Capitalism — informed by practical experience, built around principles of systemic health, anchored in scientific rigor, and grounded in universal wisdom traditions and a common sense moral framework—can provide the foundation for the new narrative we need at this critical juncture. The centerpiece of this story is that systems that last in the real world—i.e., truly ‘sustainable systems’—are systems that are healthy, regenerative energy flow networks.4 (Science now understands that everything, from matter to living beings and even human consciousness, is all energy.) While highly diverse and context-specific, vibrant systems follow a consistent pattern, one in alignment with the eight principles summarized below and described in much greater detail in the white paper. We have identified eight key interconnected principles that underlie systemic health. Note that it is in the pattern, the relationships among all eight (and more) principles, operating coherently within one system, across all scales of the system from local to global, that the ultimate power and potential can be found. In this sense, regeneration is an all-or-nothing proposition. Either a system is healthy and vibrant or it’s not. And it is only as healthy as its weakest link. Aligning the modern global economy with these principles is NOT tweaking around the edges. It represents profound change (threats and opportunities) for many enterprises, entire industries, and public policy. Anything less profound would simply not pass the credibility test given the enormous challenges we face. Humanity is an integral part of an interconnected web of life in which there is no real separation between ‘us’ and ‘it.’ The scale of the human economy matters in relation to the biosphere in which it is embedded. We are all connected; damage to any part of that web ripples back to harm every other part as well. There is much work to do here in disconnected, atomized finance in which speculation dominated capital markets and extreme complexity in mortgage lending have severed the critical relationship between owner and enterprise, lender and borrower. But the principle also applies at the macro scale, the imperative that the aggregate material throughput of the economy be in right relationship with the scale of the biosphere within which it is embedded. In a world in which change is both ever-present and accelerating, the qualities of innovation and adaptability are critical to health. It is this idea that Charles Darwin intended to convey in this often misconstrued statement attributed to him: “In the struggle for survival, the fittest win out at the expense of their rivals.” What Darwin actually meant is that the most ‘fit’ is the one that fits best (i.e., the one that is most adaptable to a changing environment). Of all the principles, this one is best understood and accepted in our contemporary paradigm. One out of eight ain’t so bad! In an interdependent system, fitness comes from contributing in some way to the health of the whole. The quality of empowered participation means that all parts must be ‘in relationship’ with the larger whole in ways that not only empower them to negotiate for their own needs, but also enable them to add their unique contribution towards the health and wellbeing of the larger wholes in which they are embedded. In other words, beyond whatever moral belief one has, there is a scientifically grounded systemic requirement to address inequality, for the health of the whole. Each human community consists of a mosaic of peoples, traditions, beliefs, and institutions uniquely shaped by long-term pressures of geography, human history, culture, local environment, and changing human needs. Honoring this fact, a Regenerative Economy nurtures healthy and resilient communities and regions, each one uniquely informed by the essence of its individual history and place. This principle poses a profound challenge to the modern global corporation, but forward-thinking leaders are already moving toward a more distributed management structure connected to place. Creativity and abundance flourish synergistically at the ‘edges’ of systems, where the bonds holding the dominant pattern in place are weakest. For example, there is an abundance of interdependent life in salt marshes where a river meets the ocean. Edges are also where risk lies. At those edges the opportunities for innovation and cross-fertilization are the greatest. Working collaboratively across edges—with ongoing learning and development sourced from the diversity that exists there— is transformative for both the communities where the exchanges are happening and for the individuals involved. Business leaders understand that the boundary of the firm is no longer the relevant ‘whole’ under management. If only Wall Street analysts understood too. Just as human health depends on the robust circulation of oxygen and nutrients, so too does economic health depend on robust circulatory flows of money, information, resources (circular economy), and goods and services to support exchange, flush toxins, and nourish every cell at every level of our human networks. The circulation of money and information and the efficient use and reuse of materials are particularly critical to individuals, businesses, and economies reaching their regenerative potential. This principle holds the promise of a whole new set of metrics to monitor (alternatives to GDP), and with them, supportive public policy options. Being in balance is essential to systemic health. Like a unicycle rider, regenerative systems are always engaged in this delicate dance in search of balance. Achieving it requires that they harmonize multiple variables instead of optimizing single ones. A Regenerative Economy seeks to balance efficiency and resilience; collaboration and competition; diversity and coherence; and small, medium, and large organizations and needs. It runs directly against the (short-term) ‘optimize’ ideology that is at the root of modern financial logic. The resulting theory shows us how to build vibrant, long-lived, regenerative economies and societies using the same holistic principles of health found consistently across widely different types of systems throughout the cosmos. This theory grounds our understanding of why integrity, ethics, caring, and sharing lead to socially vibrant communities and healthy economies— while at the same time making perfect practical and scientific sense. It differs most from current approaches to sustainability in that, instead of focusing on social and environmental health using traditional reductionist logic to ‘solve problems,’ it aims directly at building healthy human networks as the objective, drawing on universal principles and patterns, with ‘sustainability’ becoming the natural byproduct of systemic health. It is like (holistic) healthcare in contrast to (reductionist) disease care. Because the theory focuses on building healthy human networks, it is not actually new. Instead, it has been discovered and rediscovered time and again over the millennia, appearing from the ancient Greeks’ invention of democracy, to the rules of mutually beneficial, give-and-take relationships that allow stake-holder-owned enterprises to be effective today. Furthermore, instead of a political philosophy of the left or right, this rigorous form of holism specifically sees regenerative economies as a new stage of capitalism built around an integration of the best of both political leanings. Consequently, instead of jettisoning capitalism wholesale, this holism uses the universal design principles underlying all systemic health to show us how to preserve and build on the many strengths of our free enterprise system, while addressing its failings head on. While we expect healthy debates among liberals and conservatives to continue, the scientific framework behind regeneration places them in a new context with sharp contrasts between regenerative perspectives and current assumptions. This integrated approach offers the potential for polarized perspectives to find common cause in the best of both side’s original ideals. One can quibble with the designation and language of these eight principles — it’s impossible to adequately describe non-linear patterns in linear language—and one can always add principles to deepen understanding. But unless one can refute the assertion that all sustainable systems in the universe behave according to common patterns that exist across scales (fractal patterns), then one either accepts our hypothesis that only when human economies are brought into alignment with these principles and patterns will we have a sustainable economic system or one needs to make the case as to why human economies are the only exception to the rule. Consider an analogy to human health. The human body is a well-developed ‘energy flow network’ that literally regenerates its cells every seven years. If you want to be healthy, you need to invest in the health of your immune system (secure nutritious vital inputs, ensure ability to process waste effectively), exercise regularly, sleep well, and have meaning in your life. Health is the outcome. If we live a stressed life, eat poorly, drink contaminated water, don’t get enough sleep or exercise, but then try to mitigate by treating the symptoms of our disease, we will never be truly healthy. The same goes for an economic system. We need to understand the principles and patterns of systemic health, rather than accept them and attempt to mitigate after the fact with policy interventions that merely address the symptoms of our ‘disease’ (unemployment, inequality, rising violence in our cities, financial bubbles and malfeasance, climate change and toxins in our environment, etc.) that result from the flawed system design, built on a flawed theory, limiting, as Einstein warned, our ability to see genuine solutions. Therefore, since (we assert) human economies are also energy flow networks, we suggest that the best and likely only way to achieve lasting prosperity and wellbeing is to build healthy human networks following these same universal patterns, ones capable of generating widespread social and economic vitality across all levels of society. Today’s science of regenerative systems (still in early stages of development) can show us how to achieve such widespread wellbeing by both identifying the universal principles that support durably vibrant systems and giving us precise measures and targets to guide our steps. The contrast between this story of how to build a healthy economy and today’s dominant neoliberal theories is striking. While democratic, free enterprise systems theoretically promote widespread empowerment and wellbeing, today’s so called ‘free market’ version of capitalism (or any socialist system that I am aware of, for that matter) is failing because it promotes largely erroneous beliefs about how to create a healthy economy. Conventional theory (whether of the conservative or liberal variety) sees economic growth as the path to prosperity, with debates over how much government intervention and redress to mitigate after the fact the negative consequences ranging from rising inequality to climate change. In other words, we debate how to deal with symptoms of ill health rather than designing into the system the incentives and feedback loops that eliminate the undesirable outcomes in the first place (which is the way all sustainable systems we know actually work). The broad shift in vision accompanying Regenerative Capitalism will be just as profound as the one Copernicus precipitated when the revelation that the earth traveled around the sun undermined the infallibility of medieval authorities and changed our view of how the world worked. Our transition will be chaotic, filled with profound and frightening challenges. It’s underway. To help meet these challenges, we have offered a new story, a synthesis of many thinkers’ insights with the actions of intuitive entrepreneurs manifesting this change on the ground into a coherent and scientifically rigorous conceptual framework. It provides a hopeful and credible alternative to the pessimism our current, looming global threats can instill, the uncritical techno-optimism we are genetically wired to believe in, no matter how irrational, and the naïve head-in-the-sand denial that is all too prevalent today. dormant in entire human networks, waiting to be activated at systemic scale. This is The Source of great hope that the emergence of Regenerative Capitalism represents! A new awareness of regenerative design principles and patterns coupled with accelerating pressure for change due to accelerating crises will make reforms that seem impossible today become inevitable. When properly articulated, the new narrative will break down seemingly intractable barriers. For example, the new framework can help both left and right see that the ideological battle between free markets with little government and big government with regulated markets is largely a false choice. The real choice is between effective and ineffective tools and effective and ineffective system design. This new Regenerative Capitalism framework will change the debate and forge profound public policy changes in the US and around the world. For example, where conservatives and liberals, Wall Street chieftains and central bankers, and mayors and labor union leaders currently argue over how best to foster ever-increasing yet undifferentiated economic growth, in the future economic debates will center on how best to foster regenerative development that is aligned with how economic flow networks actually work. In short, this new narrative illuminates a pathway that transcends our broken national and global politics and gets us to a new space where we can grapple effectively with the urgent work at hand. Will we choose to follow it? Our long-run prosperity and our very survival both depend on nothing less than this once-in-the-history-of-civilization transformation to a regenerative civilization based on a holistic worldview. This is the Great Work awaiting us in the 21st century. 4 Goerner, S., Dyck, R.G., & Lagerroos, D. (2008). The new science of sustainability: Building a foundation for great change. Chapel Hill, NC: Triangle System for Complex Systems. 6 www.footprintnetwork.org/en/index.php/GFN/ 7 Regenerative thinking guru Carol Sanford and Regenerative Design experts at Regenesis Group focus their work on tapping into the unique essence of people and place. At the level of conceptual construct or theory and consciousness, I loved the article and appreciate the role of consciousness in co-creating global and local transformation and regeneratively in terms of the planet, economy and people. At the level of actual practice and leverage points (boundaries, edges, etc.?) for implementing the wholistic theory, the article left me feeling less empowered, realizing no individual or group has the “power” to control or leverage to bring about the needed whole system needed change, while keeping it all in balance. That one article can’t do everything is a necessary reality. I suppose we always live in a “Chaordic Age”.